Around the time an Initialized Capital company finds product-market fit, one of the very first topics we dig into with them is finding their growth channels. Any startup that isn’t looking at optimizing their growth to expenditure rate could not only end up burning through all of its runway, it may not be able to attract follow-on funding from other later-stage investors. So it’s important that companies have a good handle on how they acquire users on Day 0 and get them to come back week-over-week and month-over-month. In our first conversation, we’ll usually start with walking through a couple basic questions. We’ll map out different pathways to the product and draw the critical user journeys through the product itself. It’s a very interactive process where we might talk through these processes verbally, while visually illustrating them and jotting notes down over various sessions. First question: Who are your customers and how do you reach them? This sounds like a simple question and in some cases, it might be really easy. But in other cases like when you’re operating a two-sided marketplace, you might have to think about whether you have the right consumer. Let’s say you’re doing a marketplace for buying and selling homes. Is your customer the buying agent or the selling agent? Is it real estate organizations? Or is it ultimately the home buyer and you should optimize all pathways for them? In this case the buying and selling agents are conduits to the end customer rather than the end customers. 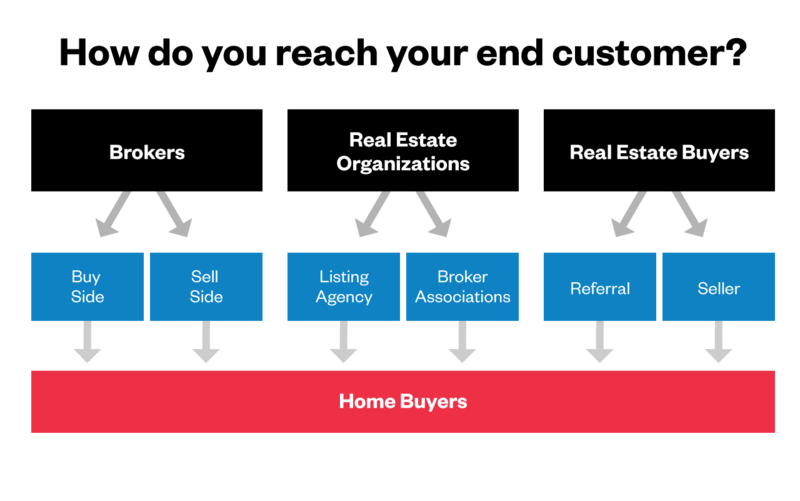 This is the same with different types of real estate organizations or even past buyers who become sellers themselves. It is worth taking the time to survey and evaluate every person you interface with since they can end up being a very important conduit you’ll rely on to reach your end customers. Second question: What is your customer’s pathway to you and how do you attract them? Once you have identified your end customer with various conduits to them you should lay out specific pathways through each with different tactics tailored to each path. Let’s say you’re a health tech company and you get customers either from medical practices or through health insurance companies. What you’d have to do here is draw out of a user flow or chart that shows step-by-step how customers eventually reach you. Simple examples of growth channels of customer acquisition for a health tech startup. These are called your Growth Channels. This exercise often reveals that with multiple conduits there are always multiple channels to acquire customers requiring different tactics from different sources. Next we stack-rank all of the growth channels to see which ones are organically high-performing looking at volume, level of effort, conversion rate, repeatability and more factors. Then we start asking questions about every single channel. Could this channel be stronger than it is today? If so, how? Can we replicate the performance of this channel via a different method? For two-sided marketplaces, we also ask questions about how to leverage network effects emerging from each side. Can we use one side of the marketplace to disproportionately benefit or attract more customers from the other side? For example, let’s say you’re selling car parts. If you add brake suppliers in addition to muffler suppliers, will that enable you to attract a larger volume of buyers looking for one stop shop instead of using multiple vendors? Lastly, make sure you utilize your networks to see if your investors, advisors, or friends and family have large followings or know “influencers” in your industry to help with getting the right message out. After looking at the effectiveness of each channel, you’ll want to look at how much ROI you get for dollars AND resources spent. If it’s very early on in your company’s lifecycle, you might not be able to calculate a dollar amount but you can think analytically about data like — how many members or attendees are at a given conference or trade show to make it worthwhile to set up a booth or how many hours will it take to hire a temp compared to the effort needed to train. You can also look at your skill set: do you, for example, know how to operate a trade show booth well? Can your networking skills offset the travel and cost of attending a conference? 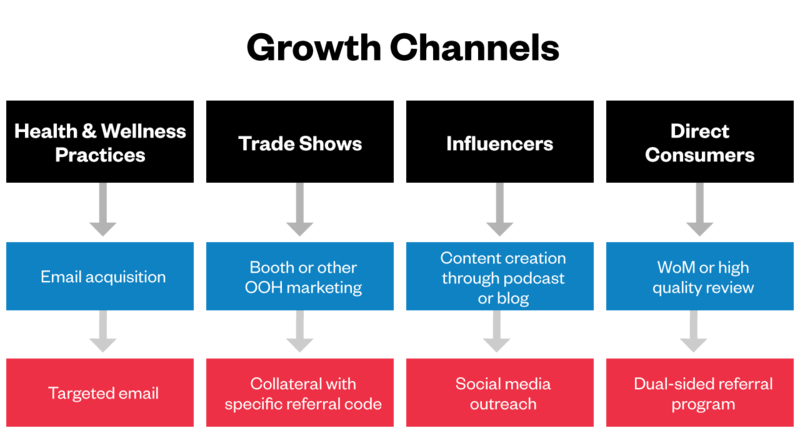 Do you have strong connections in your industry’s “influencer” network? Once you’ve mapped out your growth channels within your product, the next step is reversing them. Can you flip them around with your customer or consumer as your best hook? Let’s say you’re that health tech company and doctors are your customers, are there ways you can use those customers to in turn attract more referrals? Can you put materials or brochures in all of your doctor’s offices? Can they promote you at trade shows? These are just a few ways we work with our startup companies in mapping out their initial growth channels. Much of this seems obvious, but talking through this simple exercise has proven valuable for almost all of our startups. We suggest going through this exercise within the first six months of your startup and then at least every year if not more depending on your company’s growth cycle.